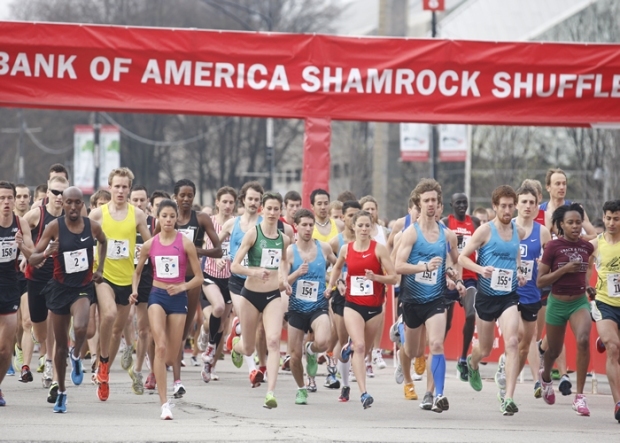 Register while you still can for the 2014 Bank of America Shamrock Shuffle, an 8K road race through downtown Chicago. Shamrock Shuffle organizers announced in early February that the race had surpassed the halfway mark for registration. The registration cap is at 40,000, making it one of the 10 largest races in the United States and one of the 20 largest in the world. "For 35 years, Chicagoans have run away from winter and into spring at the Bank of America Shamrock Shuffle 8K, and we're excited to do it again this year," Executive Race Director Carey Pinkowski said. "We're experiencing historic cold in Chicago ... but that's what will make Sunday, March 30, all the more rewarding, as it will kick off a fun-filled running season in Chicago, for those who might be training for the Bank of America Chicago Marathon in the fall, and for those looking to stay healthy and motivated in 2014." The race begins and ends in Grant Park, and the course winds its way through the streets of downtown. Organizers will host a post-race party in Grant Park featuring live music, food and drinks. The event is free and open to the public. If you're not a runner yourself, you can track other runners and watch the race live at NBCChicago.com. Runners can register individually or as part of a team. The registration fee is $45, and participants can sign up online at ShamrockShuffle.com. There is no waiting list, so be sure to sign up while there are still spots.